This image from Dec. 7, 1972, shows a view of Earth as seen by the Apollo 17 crew - Gene Cernan, Ronald Evans and Harrison Schmitt - as they traveled toward the moon. The view extends from the Mediterranean Sea area to Antarctica. This was the first time the Apollo trajectory made it possible to photograph the south polar ice cap. 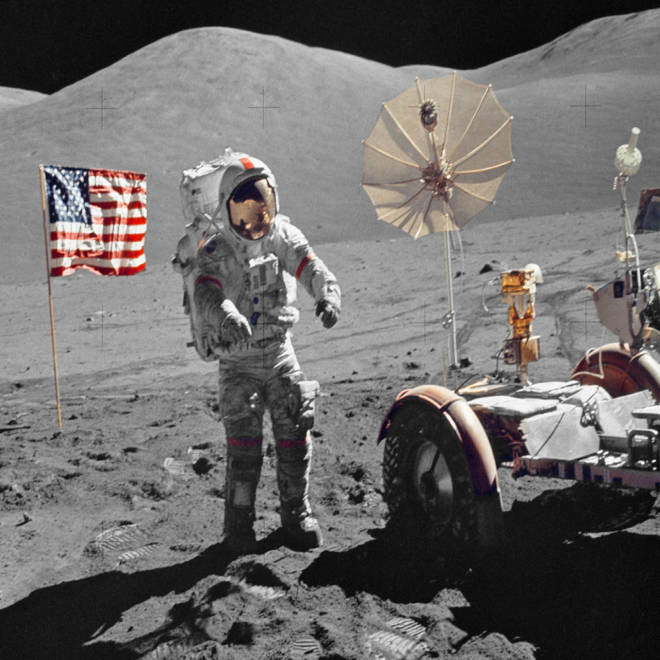 It's been exactly 40 years since NASA sent astronauts to the moon for the last time, and even though more than half of all Americans weren't alive when Apollo 17 got off the ground, the mission still has a big impact on our collective memory. And perhaps the biggest impact comes in the form of a single photograph, the original Blue Marble picture of Earth's full disk. Hours after their launch on Dec. 7, 1972, Apollo 17 commander Gene Cernan and his crewmates — Harrison Schmitt and Ronald Evans — oohed and ahhed over their home planet, suspended in the blackness outside their window. "I know we're not the first to discover this, but we'd like to confirm ... that the world is round," Cernan told Mission Control. Astronauts had been seeing the full planet from beyond Earth orbit since 1968, when Apollo 8 made a looping trip around the moon and back. In fact, Apollo 8's "Earthrise" picture of our planet at the moon's horizon also ranks among the most memorable space pictures ever taken. But there was something extraordinary about the view during Apollo 17's trip: The planet's entire disk was sunlit — a sight that astronauts had never captured on film before. The trajectory provided the best look yet at Antarctica, and Schmitt marveled over the clear view of Africa. "If there ever was a fragile-appearing piece of blue in space, it's the Earth right now," Schmitt said. When the original picture was released, it made front pages around the world — and it inspired a continuing series of Blue Marble images, including a version that's been commonly used on iPhone displays. Just this week, NASA released a set of "Black Marble" nighttime satellite pictures to add to the Marble repertoire. Ezra Klein tells the story of how the astronauts of the Apollo 17 mission took what would become one of the world's most widely distributed images - Earth's fully lit face. Doing science in space: Apollo 17 was the first NASA mission to include a professional scientist: Harrison Schmitt, who had a Ph.D. in geology. John Logsdon, former director of George Washington University's Space Policy Institute, recalls that Apollo 16 and 17 were almost canceled during the Nixon administration due to budgetary concerns. "It was the outcry from the science community ... and the fact that Nixon really didn't want to cancel them, that saved those missions," Logsdon said. Apollo 17 was arguably the most scientifically oriented mission to the moon — and helped set the precedent for research on the space shuttle and the International Space Station. The beauty of a night launch: The post-midnight launch marked the first time that a NASA manned spacecraft took off at night, and the brilliant blaze of the Saturn 5 rising into the darkness became another iconic picture. It would be more than a decade before the next night launch from Florida: the shuttle Challenger's liftoff on STS-8 in 1983. Orange soil: One of the most remarkable scientific discoveries came when Schmitt spotted orange-colored soil during the second of the mission's three moonwalks in the Taurus-Littrow valley. "It's all over! Orange!" he said. He and Cernan made sure that the stuff was included in the mission's 243 pounds (110 kilograms) of lunar rock and dirt — the largest haul of samples ever brought back from the moon. Researchers determined that the orange soil consisted of glass beads formed from lava ejected during volcanic eruptions on the moon, about 3.7 billion years ago. Such findings have helped scientists understand the violent processes that were at work on the moon early in its existence. Singin' on the moon: The astronauts had serious work to do during their three days on the lunar surface, but there were moments of levity as well. The best-known moment came when Cernan and Schmitt crooned a tune as they skipped on the moon. "I was strolling on the moon one day, in the very merry month of December," they sang. Last man on the moon: When Cernan prepared to climb up the ladder from the moon's surface into the Challenger lunar module for the last time, he told Mission Control that he believed the next steps on the moon would be made "not too long into the future." Logsdon said it was well-known at the time that the next moon mission wouldn't happen for a decade or more. "But I don't think any of us thought it would be 40 years, or really more than a half-century," Logsdon said. NBC News' Cape Canaveral correspondent, Jay Barbree, told me that Cernan isn't fond of his "last man on the moon" title. "He likes to be called 'the most recent astronaut on the moon,'" Barbree said. "That's his way of saying we're going back." This week, Bloomberg.com's James Clash quoted Cernan as saying that he "honestly believed it wasn't the end, but the beginning." At the time, he told himself, "We're not only going back, but by the end of the century, humans will be well on their way to Mars." "I left my Hasselblad camera there with the lens pointing up at the zenith, the idea being someday someone would come back and find out how much deterioration solar cosmic radiation had on the glass. "So, going up the ladder, I never took a photo of my last footstep. How dumb! Wouldn’t it have been better to take the camera with me, get the shot, take the film pack off and then (for weight restrictions) throw the camera away?" How long will it be before someone comes across Cernan's camera and does the damage assessment? If you remember the Apollo moon missions, what did they mean to you back then, and what do they mean to you today? If you don't remember Apollo, do those missions still tug at your psyche, or does this all seem like ancient history? Feel free to leave your remarks or reminiscences as comments below, or send them as emails to cosmiclog@msnbc.com. I'll compile the best of the bunch for a follow-up item next week. We'll also have a look at how the moon may (or may not) figure in future space exploration. Update for 6 p.m. 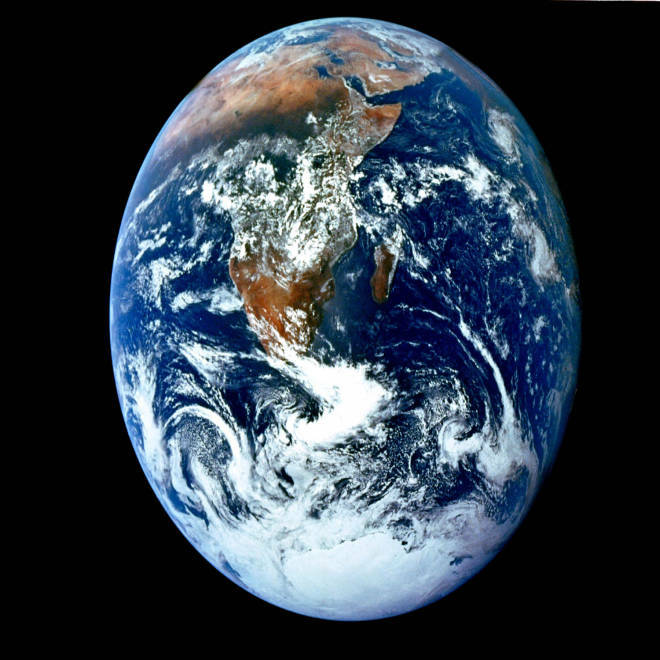 ET: So who took the Blue Marble picture? That's been the subject of debate for decades, and no one at NASA has ever come up with a definitive answer. "I've actually been to events where all three of them kind of jokingly take credit for it," NASA's Mike Gentry told the Australian Broadcasting Corp. in 1999. The question has apparently been a sore point for Schmitt and Cernan in recent years, but when Barbree asked Cernan about the matter, the mission commander took the standard diplomatic line. Here's what Barbree says Cernan told him about who had the camera: "We were passing it around, and passing it around, and we really don't know who shot it. One of us did."